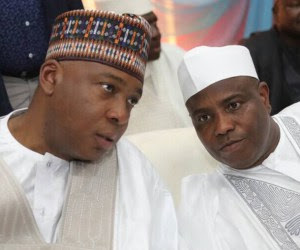 The party is wooing Saraki, Sokoto State Governor Aminu Tambuwal, his predecessor, Senator Aliyu Wammako, former Governor Rabiu Kwankwaso (Kano) and former Governor Danjuma Goje (Gombe) to return to its fold in order to wrest power from the APC in the coming general elections. Although sources told The Nation that the request of the APC chieftains tagged as “game changers” had been “tactically rejected” by the National Executive Committee (NEC), PDP spokesman Kola Ologbondiyan claimed that no decision has been taken on the issue. ”We want Tambuwal, Kwankwaso, Wammako, Goje and others in PDP because we see them as game changers. We are also targeting ex-Governor Sani Ahmed Yerima of Zamfara State who has always been in the opposition until the APC coalition emerged. Responding to a question, the source added: “None of these leaders has given the PDP any commitment because they are weighing the options. Some of them have given sufficient signal that they might quit APC. “We were wary of the request for change of name in order not to cause crisis in PDP. If we accede to their request, the Uche Secondus-led NWC will technically cease to exist..."